Fund groups have the opportunity to enhance the traditional teleconference experience with an online component to reach advisors, who are increasingly self-educating and engaging online. 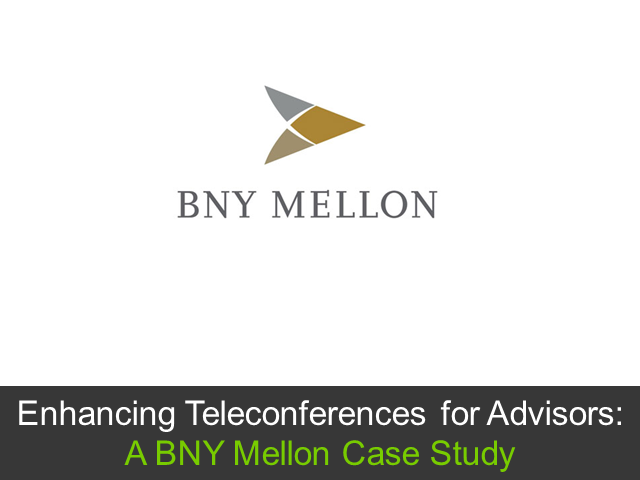 Join us for this live webinar to find out how BNY Mellon is securely leveraging the Web to increase their teleconference attendance and engagement levels while gaining unprecedented customer insight. Taking inspiration from best-in-class marketing departments working across both the Technology and Financial Services organizations, this presentation looks at the situation, strengths, differences and challenges of each sector. Whilst vastly different sectors, all too often both can be too inwardly-industry-focused and in fact both have much to learn from each other. This session will provide examples of best-in-each-sector and will provide actionable ideas to take back to the business; to further enrich your roles and the robustness of your own marketing strategy. Video is no longer just a buzzword in marketing. It is a revenue generation tool that every B2B marketer needs to utilize in order to help their business grow. But the options available are countless. How should marketers establish their video marketing priorities to ensure maximum ROI? Where do you even begin with a video campaign? What strategic, creative, production and distribution resources do you need to engage with? For most marketers, connecting the dots between campaigns and revenue poses a complex challenge. With extended B2B sales cycles, it’s difficult to track and analyze each touchpoint, and even harder to determine which action was most influential in closing a deal. As a result, only 22% of marketers believe they’re using the right attribution model, according to Bizible. In this live roundtable, our panel of marketing experts will discuss the current landscape of attribution and ROI, highlighting areas where marketers can improve and fine tune their strategies. As more marketers rely on content marketing to educate prospects and move them through the funnel, it’s becoming increasingly difficult to break through the noise and identify effective methods to connect with your best buyers. The answer isn't always creating more content—it’s getting the most out of your best content. In this webinar, we’ll share 10 underutilized tactics you can use to broaden your content exposure and improve engagement at all stages of the funnel. We asked BrightTALK’s community of CMOs and marketing executives one simple but important question: What are your marketing predictions for 2017? Join us live as we share the most compelling responses. We’ll review the biggest B2B marketing trends of 2016, the current martech landscape, and the priorities of marketing leaders in the year ahead. As marketing continues to grow more scientific, vendors are expected to deliver more value not only in their own technologies, but also in combination with the rest of the marketing tech stack. Join BrightTALK as we review marketing automation best practices for webinars, including real-world examples of running webinar programmes and reporting in Marketo using BrightTALK’s advanced connector. By integrating your marketing automation platform with BrightTALK, you can drive ROI with more webinar engagement data and reduced follow-up time on your leads with our hourly sync. Join LeadMD and BrightTALK as we review marketing automation best practices for webinars, including real-world examples of running webinar programs and reporting in Marketo using BrightTALK’s advanced connector. Whether delivering webinars or sharing decks via SlideShare, marketers need to create presentation content that keeps their audiences engaged—and persuades them to take action. Developing effective presentations for an online audience, however, is easier said than done. How do you create memorable, persuasive content in this era of constant distraction? How do you create presentations that get your audience to put down their phones and start paying attention? This is where the science comes in. Research has shown that there are a few key tactics that you can employ to create marketing presentations that your audience won’t forget. - Why visuals and storytelling are the keys to effective presenting. In a data-centric workforce, metrics and benchmarks provide professionals reasons to invest, alter, and evolve their strategy. One of the biggest trends in content creation and delivery is conducting surveys to capture your target audience’s pain points, thoughts, strategies, and drivers. As companies continue to compete for market space, one strategy to approach the industry is to create and conduct insightful studies. Prospects and customers alike want to understand the latest trends, what their peers are doing, and where their industry is going. When done right, research elevates your gravitas in the market and serves as an effective way to engage your prospects -- both while completing the study as well as revealing the results. Data is everywhere, but unfortunately, most business users don't have the time to sort through a bunch of stats. They just want to see the bigger picture--so why not give it to them? Self-service analytics has enabled business users to access and interpret data without needing any statistics background. When coupled with data visualization techniques, we've seen that not only are business users more encouraged to make more data-driven decisions, but they are also able to do this without needing help from their BI or IT teams. When it comes to the customer experience consistency is key, especially when it costs 5x more to acquire a new customer than to keep an existing one. So, how do you design a cohesive, seamless customer experience that excites your new customers and keeps the loyalty of your customers? In the age of optimisation and testing, marketers are always looking for new ways to stand out from their competitors. Whether you’re focused on inbound or outbound marketing, there are numerous things you can do to create a better experience with your company to drive engagement -- and thus revenue. This short session will discuss some of the most underrated promotional tactics at your disposal to entice, engage and excite your prospects. Attend free webcasts to learn how to successfully apply the latest digital techniques to meet your sales and marketing objectives. During these live webcasts, which are also available on-demand, asset management marketers will share best practices and well-respected experts will offer advice on creating, distributing and actioning audience insight from your digital content.